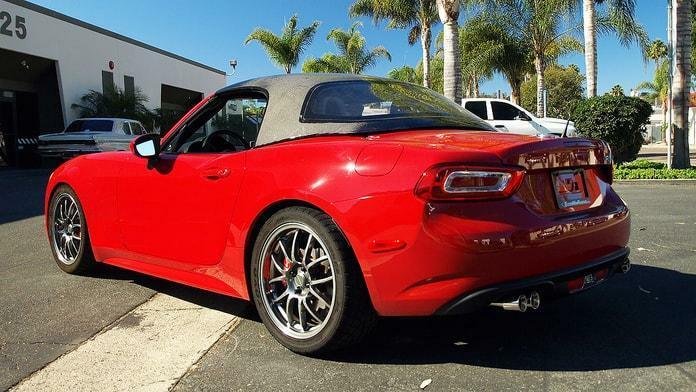 DG Motorsports in Oceanside California now offers hardtop roofs for the 2017 Fiat 124 Spider. Many convertible owners like to have a hardtop for their car for certain situations. The coupe-like conversion offers a quieter ride in some cases, and the protection from the elements and vandalism are obvious. One U.S. source for such roofs is DG Motorsports. The roofs are constructed using lightweight fiberglass with a black gelcoat finish. To keep weight down, a non-glass rear window is also used. The total added weight is only 20 pounds. DG Motorsports says that the roof is fully weatherproof and that the interior is fully finished. The roof is also made in America. Best of all, the soft-top roof is not required to be removed to mount the DG hardtop. The kit includes the easy to install mounting brackets. The price is $1,495 plus shipping. Check out the details at DG Motorsports site and look for product code 50-93-7100. Have a Carbon Fibre one on order. Should be delivered this week. Will let you know how I get on. Nice can't wait to see it.